The eventual closure of the saleyard coincided with the change of style and format of the Walton Agricultural Show, and for the same reasons. This show had been in existence for over a hundred years, and in its early days I believe it had classes for draught oxen, but by the middle of the 20th century the agricultural system which promoted and supported it just was not there. Although strenuous and praise­worthy efforts have been made to maintain its proud tradition, times change and the past cannot be recreated. In its great days the venue for the Show was in the middle of the town on the piece of land on which North, East, West and George Trollope Roads and the library and police station now stand. Here, on show day there was something for everybody. The estate owner or wealthy farmer could show pedigree bulls or ride his hunter in the show jumping competitions. Smaller farmers vied with each other in classes for pigs and sheep, schoolboys brought their rabbits to be judged, wives and daughters arranged flowers and mountains of home-made jam or cakes, and the cottager with the smallest garden could enter in the class for 'The best box of mixed vegetables'. 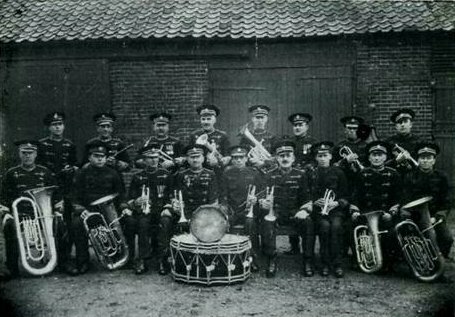 WATTON TOWN BAND — ONCE UPON A TIME! Back row (L to R) J, Cursons, Alf Markwell. Cecil Groom. Ezra Vargerson, Vie Woods. Joe Swan. Ernie Banham. John Whalebelly. Front (L to R) 'Jumbo' Semmence, Lester Groom, Ted Names. Jimmy Woods. Bob killed. Tom Garner. George Woods. Harry Siggins, Bernie Warren.